It really is hard to figure out how to share magical memories from a Walt Disney World vacation. Each one is special in it’s own way. I have memories of going as a child with my parents, on my honeymoon with TechyDad, and now with my boys. Still, one of the most amazing things to experience was our first ever family trip. This was even more special because Nana and Papa were along to see the wonder on the faces of the boys. 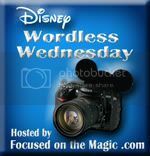 This week, the Disney Wordless Wednesday theme is “Magical Moments” and I am sharing some from that first trip with the kids in May 2009. What great memories! I love Disney. secret mom thoughts´s last blog post ..What Nice Eyes! Certainly no lack of magical memories is there? Definitely many magical memories there!! It’s so much fun to look back! The first trip is always the most magical – lovely family photos! Aw. This would make an adorable little photo book for the kids. Then they could remember the magic and tell stories as they share the photos. Very nice collection! 3 generations of magical memories= priceless!! I love all the precious and priceless pictures. The first visit to any Disney park is always the most special and unforgettable one. Love the classic Mickey one. Love your three generation picture, although somebody doesn’t seem too thrilled to be in a stroller.